…so one of our greatest organisational strategies at celebrateplay HQ, is the Daily Activity Tubs (DAT’s). Why…because they are a sanity saver. Bold claim, I know, but truly they are! Let me explain more starting with abit of the background story…Daily Activity Tubs are a concept I created as a solution to my eldest engaging in meaningful play whilst I was feeding my newborn. It was a time of change with going from one child to two children and one that needed some improvement. Since then, like my newborn the tubs have grown. However, their purpose has evolved and now they have been introduced to being used during evening meal prep time. That time of day that is commonly referred to as ‘witching hour’, where children seem to be tired, whingy, restless, difficult, clingy and a time where parents begin the evening routine in the hope for a restful night ahead. So, as I said-a sanity saver. Now that I have got your attention, let’s dig deeper and talk more about the nitty gritty of these Daily Activity Tubs and then the ways you can implement them in your home, because that is what it is all about-supporting and empowering you with ideas and inspiration to create meaningful play experiences in the home for your little learners. …so our Daily Activity Tubs are a series of ten (5 per child), light weight, pastel coloured flexitubs with handles purchased from Big W. Each tub is labelled with the days of the week using custom made vinyl stickers from Pretty Paper Label. They contain approximately two to three developmentally appropriate and high interest based activities. And the trick to keeping these activities interesting and of value is to only use them when you really need to (as suggested with above examples). …so how this works for us…each Sunday the resources are rotated ready to start the new week. Activities are chosen based on each child’s interests and skills. They are also determined by size so that they fit in the tub neatly. PRIME-an acronym I love to use when taking on a new teaching and learning project. P-PREPARE There are two ways to begin – either immediately with five/seven tubs per child (one for each day) or with one tub with a few activities in it, to test the waters before going all out for the five/seven tubs per child. 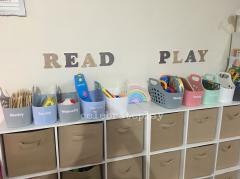 Logistics – Where you will store these tubs so children can access them easily, will you need to move them out of their reach when not in use so they hold their high interest value, will your learners benefit from different coloured baskets specific to them, and what type of daily labels will work best. R-RESOURCE We recommend batch collecting your activities in a scheduled time each week/fortnight, where you can focus on selecting developmentally appropriate activities. These are activities, your learners can complete independently whilst still enjoying a challenge. A place to document your DAT’s ideas (such as our Daily Play Planner – available as a celebrateplay subscriber) so that you are planning based on the interests of your early learners. I-IMPLEMENT Introduce the concept with some basic instructions eg. including the place you wish them to complete the activity, only using one tub per day, the activity is designed to be completed at a particular time/s of day and why that is important. Practise using the tubs, try your ideas until you find something that works best for your family. This usually involves time and trial & error. Please don’t be disheartened if the first time is not a raving success. M-MONITOR Monitor how your children are interacting with their activity tub and each other, have the activities been engaging, will you need additional resources, will changes need to be made to meet the user’s needs. E-EVALUATE This is the opportunity to observe, take notes (optional) and reflect on how well your system is working-is there quality in the activities and system, is there room for improvement, how well are your learners participating, are your learners engaged and so forth. To see more of our DAT’s tune in to our Sunday post in our support group where I share a look into our daily activities and the Monday ‘My space’ daily interactive post where I share what is happening in our playspace. 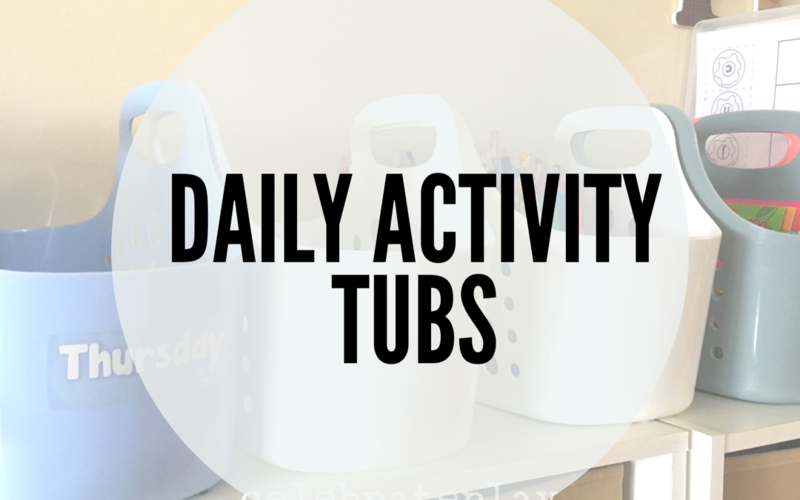 Does anyone have daily activity tubs in their home? How and when do your children use them? Do you find them handy?